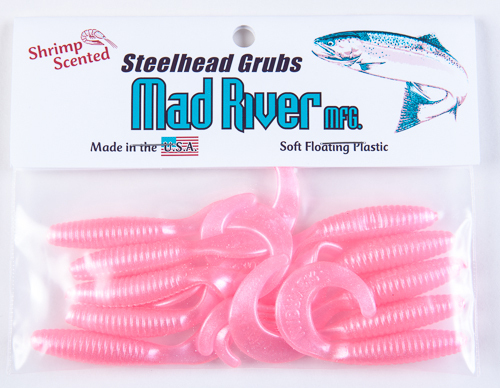 Pink Pearl Steelhead Grubs. 2 sizes to choose from. They are made of soft & supple yet durable plastic. Impregnated/scented with special formulated Atlas Mikes Shrimp Oil. Steelhead Grubs have a twirl tail that give the action to trigger a steelhead to bite. Ideal for fishing on a jig head under a float. Also great for plunking and drift fishing too. © 2019 Mad River Manufacturing. All Rights Reserved. Powered by VSM.